The macula is the central portion of the retina – the part of the retina that is responsible for detailed vision, such as reading. Cystoid Macular Edema (CME) is a condition in which the macula becomes swollen with fluid-filled cysts. CME can occur in the setting of diabetes, retinal vein occlusion, or uveitis (inflammation inside the eye). CME is most commonly seen after cataract surgery. About one to three percent of patients will have decreased vision due to CME following cataract surgery. Often, the patient will experience improved vision following cataract surgery, and then vision will begin to grow more blurred one to three months afterward. However, CME can occur many months or years following surgery. CME can occur even after uneventful eye surgery. If you experience CME in one eye, you are at increased risk for developing it in the other eye. 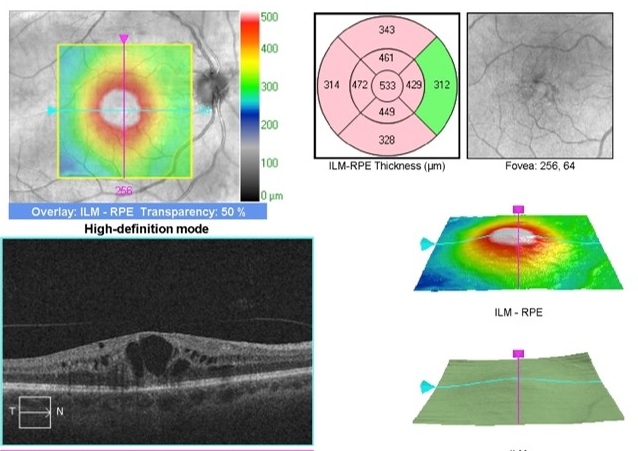 CME can sometimes be detected with a complete eye exam, but frequently specialized testing such as fluorescein angiography and optical coherence tomography (OCT) are required. These can be performed in the office on your first visit with us. With these tests, we can tell you with great accuracy whether or not you have CME. Fortunately, CME will usually improve over time, but recovery can take months. Treatment can hasten the recovery, and it is sometimes required to achieve any improvement. Usually, steroid and non-steroidal anti-inflammatory drops are given in combination for a period of weeks to months. Steroid injections in and around the eye are sometimes very effective in treating CME when it does not clear with drops. In the most severe of cases, vitrectomy surgery where the vitreous gel is removed from the eye is useful in restoring some sight.